March 10, 2011 by Alphageek in "alphageek", "review", "urbanspoon"
I decided to try An Loi based on Urbanspoon recommendations. I was not disappointed. I noticed many folks there happily eating. Don't let the location in an out of the way strip mall fool you because you are headed to a great little restaurant. I sat down and took a look at the menu. 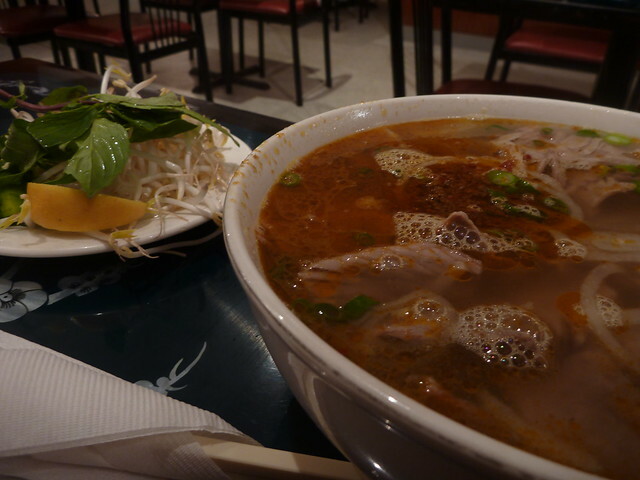 It consisted of wide variety of noodle dishes that seem to be somewhat standard at Pho restaurants. As I took a look at the fare, one dish in particular jumped right out at me. I selected the soup you see because of the ingredients. It has heat (a little chili pepper symbol on the menu), lemongrass and brisket. I quickly decided I could not go wrong with such a great combination of tastes. When my dish arrived, I snapped a quick photo to show you, and then dived right in. I found this an absolutely delicious soup. This was certainly a soup that made for a great meal on a night when the wind was howling and rain was threatening. The heat was just right, the meat was supremely tender, and the lemongrass beautifully fragrant. The Thai basil and lemon wedge made for the perfect flavor compliment to the soup. I will also mention that I have had the spring rolls and pho here, and found both to be the equal to the soup I described here. I certainly look forward to a return visit, if business ever takes me here again.